In this world Glover is Deni, a local singer whose ambition is twofold: He wants to win the heart of his childhood sweetheart Kofi (Rihanna) and produce a music festival to cheer up the island’s population. Right now, American popular culture is a strange, multiheaded beast. Many of us had never heard of Nipsey Hussle until he was shot dead recently. The coverage suggested an interesting figure: rapper, entrepreneur, and social activist. Apparently he campaigned against gun violence and the gang-war culture of certain neighbourhoods in Los Angeles. And he was shot dead outside a clothing store he owned. The interesting thing about such a figure is that he was famous and influential inside one niche part of popular culture in the United States. Some artists or performers transcend that niche to become internationally significant. Right now, Donald Glover is an important example of someone in that role. An actor, musician, writer, director and collaborator, his stature is huge, in terms of both fame and substantial artistic achievement. But, looking at his latest endeavour, one sees the severe limitations of a built-in American perspective on the world and what matters. 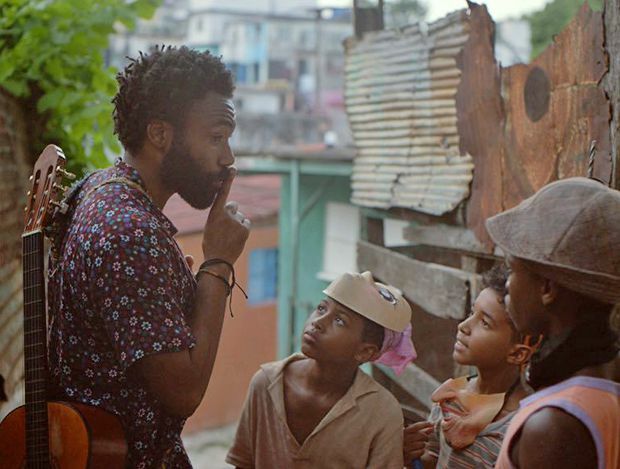 Guava Island (now streaming on Amazon Prime Video) is Glover’s latest work, an hour-long drama with music that Glover, working with his brother Stephen, director Hiro Murai and co-star Rihanna, filmed secretly in Cuba. For all of Glover’s substantial achievements, it is shockingly facile and utterly limited in perspective. In his 20s, Glover went from writing episodes of 30 Rock to starring on NBC’s surreal comedy Community. From there he developed a career as a stand-up comedian and musician, performing the latter role as Childish Gambino. Then he created and starred in Atlanta, one of the truly original, off-kilter, compelling and humane comedies of the past decade. He also managed to fit in a starring role in the movie Solo: A Star Wars Story. All true, perhaps, but Guava Island relies on overused themes and its preoccupations are unnervingly limited. It’s made in Cuba but makes no connection to Cuba. The island is merely used as a visual backdrop to create the illusion of a mythical island where people once lived for fun and pleasure, and now have to work seven days a week. What makes the production so disappointing is that the inherent thematic limitations are presented beautifully. Guava Island is gorgeous to look at, given a retro, nostalgic quality by Hiro Murai, who also directs many episodes of Atlanta. In this world Glover is Deni, a local singer whose ambition is twofold: He wants to win the heart of his childhood sweetheart Kofi (Rihanna) and produce a music festival to cheer up the island’s population. In the matter of the first ambition, Kofi just looks at him with affectionate skepticism. Rihanna doesn’t sing, which seems very odd. She merely plays the role of muse and is obliged to look admiringly at Deni’s dancing when he performs a song for her. And in the matter of the second ambition, delighting people with music, Deni is crushed by the anger and resentment of the despot Red Cargo, which controls all the factories on the island and doesn’t want work interrupted by a musical performance. In the end – and this isn’t giving away much about this very slight film – Deni is killed and his death leads to the kind of celebration that he couldn’t provide with his music festival. It’s a parable about corporate ownership, perhaps. It’s a parable about gun violence, perhaps. It’s about an artist not being recognized until he is killed for his art. Maybe. Whatever is going on, it amounts to a facile, pompous take on the-artist-and-society. What makes the production so disappointing is that the inherent thematic limitations are presented beautifully. Guava Island is gorgeous to look at, given a retro, nostalgic quality by Hiro Murai, who also directs many episodes of Atlanta. There’s a wonderful animation sequence at the start which posits the mythic Guava Island nicely as a sun-drenched, peaceful paradise. There is an odd but interesting reworking of Glover’s music masterpiece, This Is America. There are a few short, funny scenes with kids. Yet, it amounts to nothing significant because the story told is roughly that of Nipsey Hussle – nice-guy musician becomes beloved and celebrated only after his death through pointless violence. It also seems to say that music and all art are weapons against tyranny. 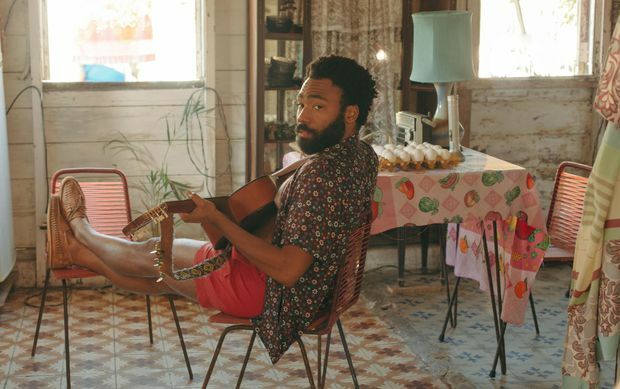 Glover has been called “one of the brightest artistic minds of his generation” by The Guardian, and on the evidence of Atlanta and This is America, that seems true. But given the opportunity to expand and given the vast financial resources of Amazon Prime Video, Glover’s perspective seems shackled to a very specific urban-America view. The most pivotal events of importance are musicians being shot. Guava Island is not an interpretation of anything. It’s a riff on the melancholy that accompanies the death of someone such as Nipsey Hussle. It’s very ordinary, and very American-ordinary.